Ambassador Carl Edward Dillery served as AFSA’s elected retiree vice president from 1991 to 1993 and as chair of the Scholarship Committee from 1997 to 2012. 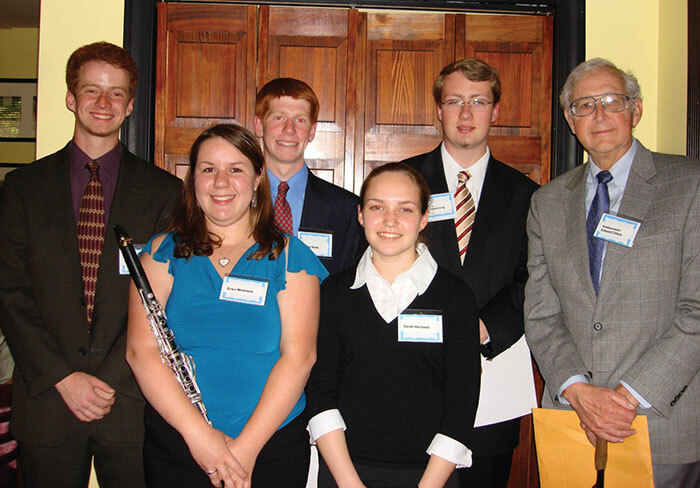 Ambassador C. Edward Dillery, at right, with 2007 AFSA Merit Award winners who were able to attend the reception. From left, Jason Meer, Erica Wickman, Andrew Keith, Sarah Haviland and Paul Armstrong. Ambassador Carl Edward Dillery, who died on Jan. 23 at the age of 85, was much fitter than Santa Claus. But in spirit, at least, Ed (as he was universally known) bore a striking resemblance to jolly old St. Nicholas, and managed to do so all year round—but most especially on Foreign Affairs Day. Each May during his nearly 15 years as chair of the American Foreign Service Association’s Scholarship Committee, Ed joyfully disbursed scholarship checks worth thousands of dollars to dozens of deserving high school students. While those funds didn’t come out of his own pocket, he seemed to take just as much pleasure from the annual ceremony as if they had. And in the process, without in any way hogging the spotlight, he transformed what could have been a repetitive series of transactions into something truly profound: an investment in each teenager’s future. 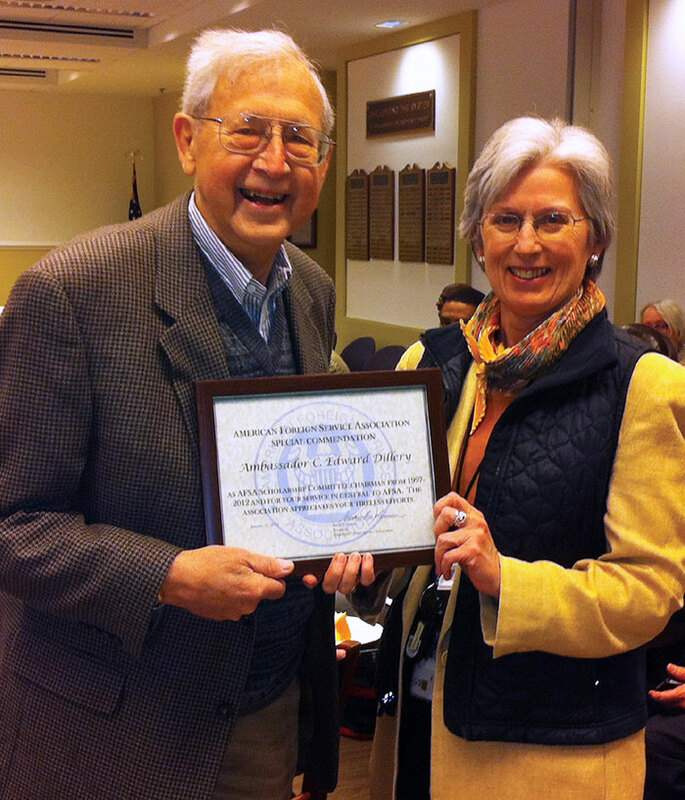 Ambassador C. Edward Dillery receives an AFSA Special Commendation from then-President Susan Johnson when he retired from the chairmanship of the Scholarship Committee in 2012. That blend of humility and beneficence was a constant throughout Ed’s 38-year Foreign Service career. 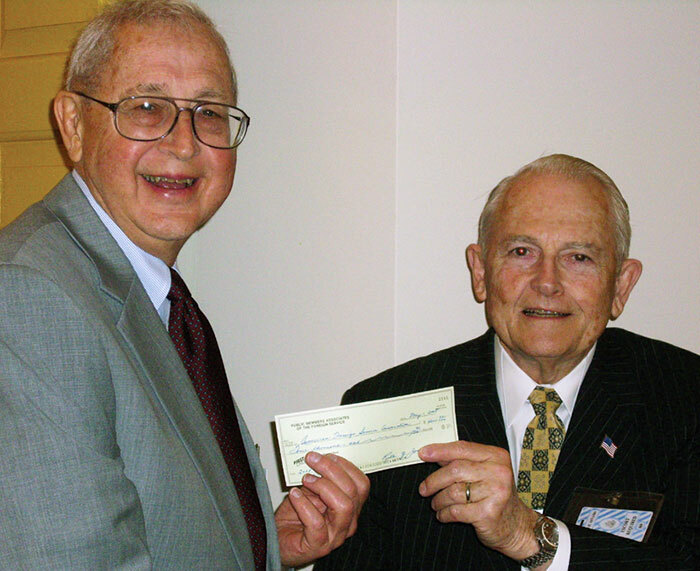 Ambassador C. Edward Dillery, at left, accepts a $4,000 check for the Financial Aid Scholarship Fund from Nick Frankhouser, scholarship chairman of the Public Members Association of the Foreign Service, on May 1, 2008. 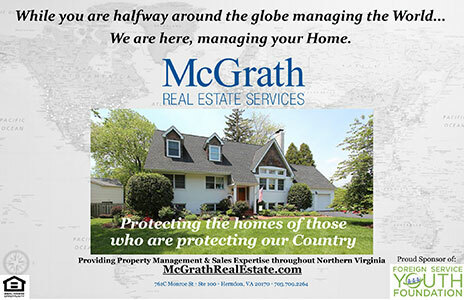 From 1955 to 1957, Ed was a foreign affairs officer in the Department of State’s Bureau of Far Eastern Affairs (now the Bureau of East Asian and Pacific Affairs). Following the back-to-back assignments in Japan (1957-1961) referenced above, he returned to the department to work in the Bureau of Scientific and Technological Affairs (1961-1965). After spending a year at the University of California at Berkeley, he served as chief of the economic section in Brussels (1966-1967). Next, Ed volunteered—much to the chagrin of his wife, Marita, as he later recounted in his ADST interview—for a tour in the U.S. Agency for International Development mission in Saigon (1968-1969). Arriving not long after the 1968 Tet offensive, he was stationed in Quang Ngai province as a senior adviser to USAID’s Civil Operations for Revolutionary Development Support program. After a detail to the Department of Defense (1970-1971), he worked in the Bureau of Political-Military Affairs (1971-1972) and attended the Industrial College of Armed Forces (1972-1973). It was also during this period that he earned his MSA degree from GWU. The next decade of his career focused on Europe, with assignments as deputy political counselor in London (1973-1976) and deputy chief of mission in Nicosia (1976-1978), followed by four years in the Office of Southern European Affairs, first as deputy director (1978-1979) and then director (1979-1982). He next spent two years as director of the Office of United Nations Political Affairs (1982-1984) before becoming U.S. ambassador to Fiji, Tonga, Tuvalu and Kiribati (formerly known as the Gilbert Islands), a post he held from 1984 to 1987. He was a real professional, a devoted Foreign Service officer and a wonderful human being. “In the traditional village, the kitchens were one end of the thatched roof house. They built little annexes on it with concrete slab and concrete blocks and a little stove and running water. They did a lot of that kind of thing and we provided the money for it. My wife and I got to open those projects with ceremonies, and when that happened we received the traditional ceremonial thank-you with the roasted pig and traditional dressed native dancers and cup bearers giving you the native drink, whale’s teeth as a sign of respect, etc. On his return to Washington in 1987, Amb. Dillery served as deputy director of the Office of Management Policy (1987-1989) and the Bureau of Management and Financial Policy (1989-1992). Before retiring from the Foreign Service in 1993, he served on commissions dealing with international broadcasting and Foreign Service personnel. 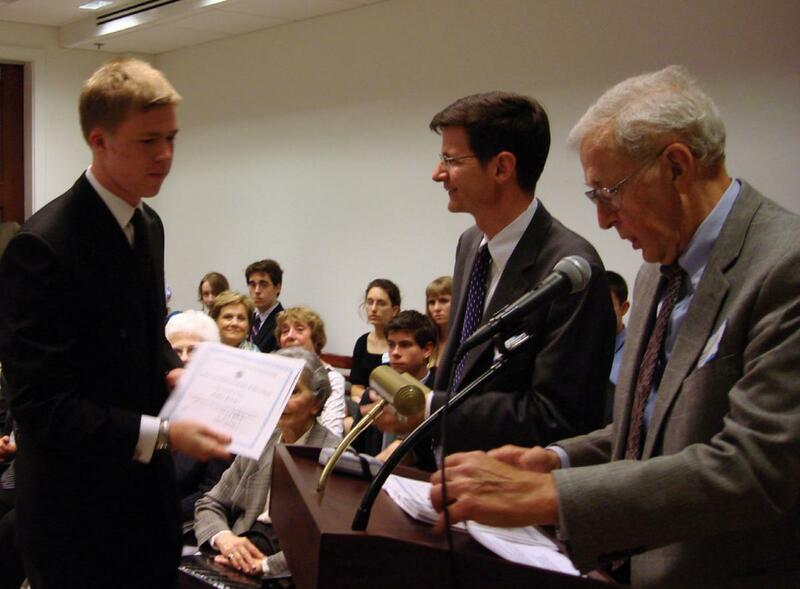 Ambassador C. Edward Dillery, at right, gives the John and Priscilla Becker Family Scholarship to Merit Award winner Joshua Downes at the May 1, 2009, reception. AFSA President John Naland, center, congratulates Downes. A longtime AFSA member, Ed served on the Governing Board as retiree vice president from 1991 to 1993. He taught several AFSA-sponsored Elderhostel (now Road Scholar) courses before becoming chair of the AFSA Scholarship Committee in 1997, and served in that capacity until January 2012. In 2004 Ed received the AFSA Member Achievement Award. Amb. Dillery was also active in the Washington Institute of Foreign Affairs, the Cosmos Club and DACOR, and he served on the board of Mediterranean Affairs, Inc. He spoke French and Japanese, and enjoyed golf, tennis and singing in the choir of the Church of the Covenant in Arlington, Virginia. He is survived by his wife Marita (Lewis) of 62 years; his children, Sara Hynes (and her husband, Jack), Edward L. (and his wife, Katie) and John (and his wife, Sara); and eight grandchildren. Donations from Mrs. Dillery and the couple’s Foreign Service colleagues have established a memorial scholarship in Ambassador Dillery’s name. Contributions are still being accepted to add to this award. 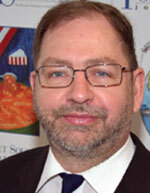 Steven Alan Honley, a Foreign Service officer from 1985 to 1997, is The Foreign Service Journal’s contributing editor. He was editor-in-chief of the Journal from 2001 to 2014.